There are places around the country where winter is still holding on with an icy fist (My Crazy Friend Marianne™ said it snowed in her small town just a couple of weeks ago), and while many people are going stir crazy, we at The Swoon Society are going fleur crazy! 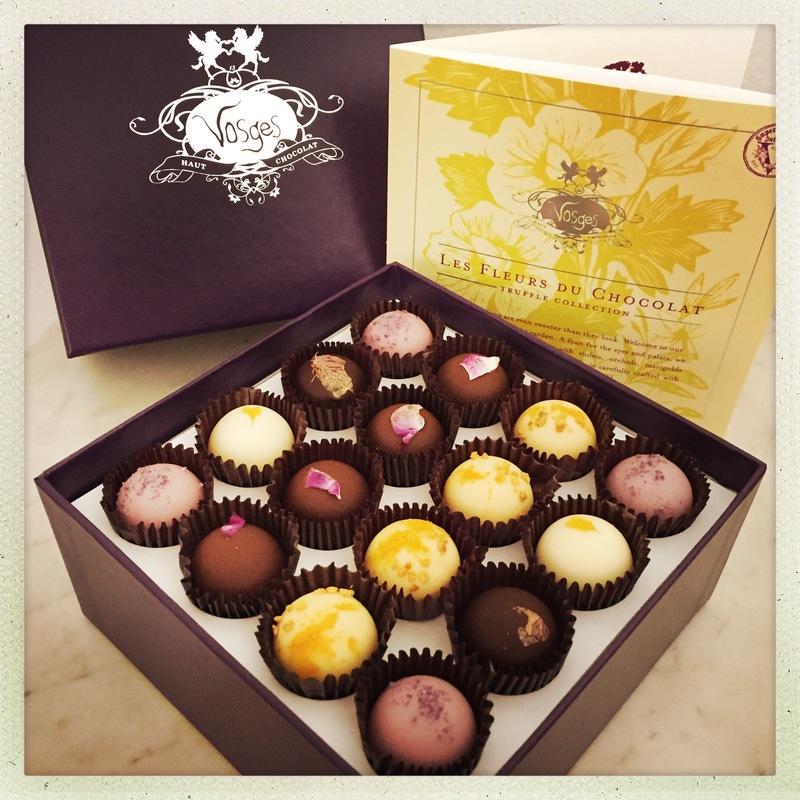 As our readers know, we love foods—particularly sweets—with a floral twist, which is why we look forward each spring to the arrival of Les Fleurs du Chocolat, a limited-time collection of truffles from Vosges featuring exotic flowers and spices. Kirsti and I discovered Vosges Haut-Chocolat (pronounced vohj o-sho-colah) in the late 1990s when the company had a single store in Chicago. We managed to catch founder Katrina Markoff on television talking about her unusual truffles with combinations like coconut/curry and wasabi/ginger—flavors that were unheard-of in the chocosphere at that time. When we saw her complete collection, which included an Absinthe truffle and one topped with a candied violet, it was swoon at first sight. I used to drool over their beautiful paper catalogs like a teenage girl with a copy of Tiger Beat, and I started setting aside a monthly allowance to indulge in their latest offerings (including four flavors of Vosges ice cream, no longer available). On a trip to New York City in 2003, I made a beeline for their newly-opened store in SoHo to sip drinking chocolates at the bar and shop for bars of chocolate on the shelves. I left in a purple haze. Katrina is endlessly inventive, and her Les Fleurs du Chocolat collection has evolved over the years to offer new surprises each spring. In addition to floral toppings like purple orchid, marigold, nasturtium, and candied violets, this year’s collection features fruit flavors (caramelized banana, Mirabelle plum, blueberry) paired with surprising superfoods, spices, and herbs (bee pollen, turmeric, lemongrass). My favorites were the Orange Coriander and Siam Citron, which left a strong “aromatic impression” of flowers from essences of orange blossom water and jasmine tea, respectively. 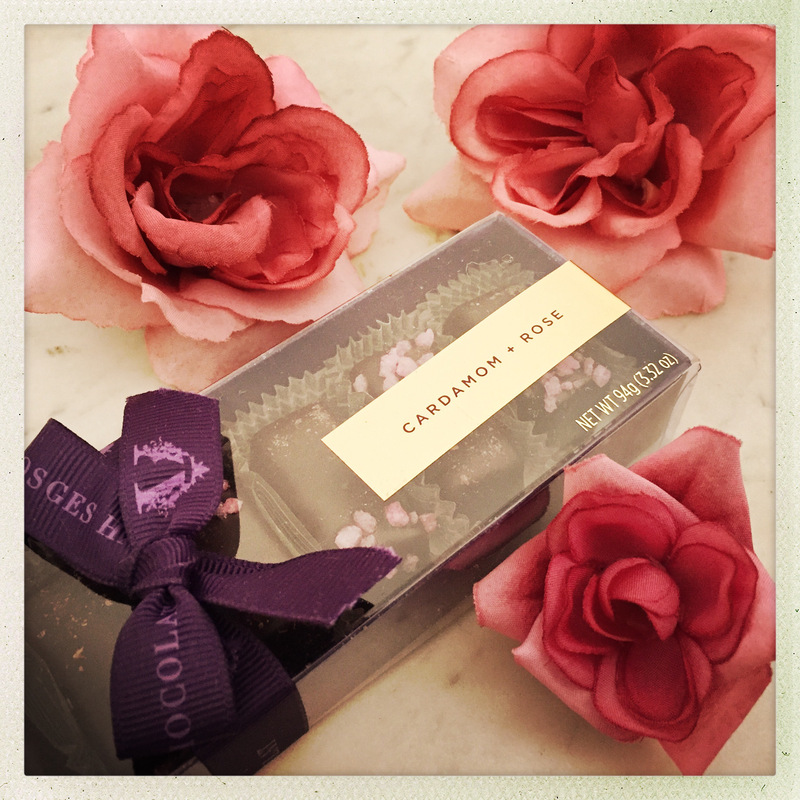 While we’re in a fleurry, let’s not forget the less flashy, but no less flavorful Cardamom Rose Caramels from Vosges’ Exotic Caramel Collection. Rose water and cardamom powder are added to soft, creamy caramels, then enrobed in dark chocolate and topped with bits of crystallized rose. There’s a reason Vosges refers to the flavors in this collection as parfums. They unfurl with each bite, blooming on the palate the way a fine fragrance opens in the nose. It may be too late to slip these bouquets into a holiday basket for someone special, but I doubt anyone will mind a rain check from the Easter bunny when the IOU is for VHC. Just remember that Les Fleurs du Chocolat is only available for a short time, so hop over to the Vosges website and place your order before this garden of floral chocolates goes dormant until next spring. Vosges has a full collection of sweets and treats for Easter, which will remain available while supplies last. A rep I spoke with said that items may still be in stock after they’ve been removed from the website, so call to place your order and ask about availability.